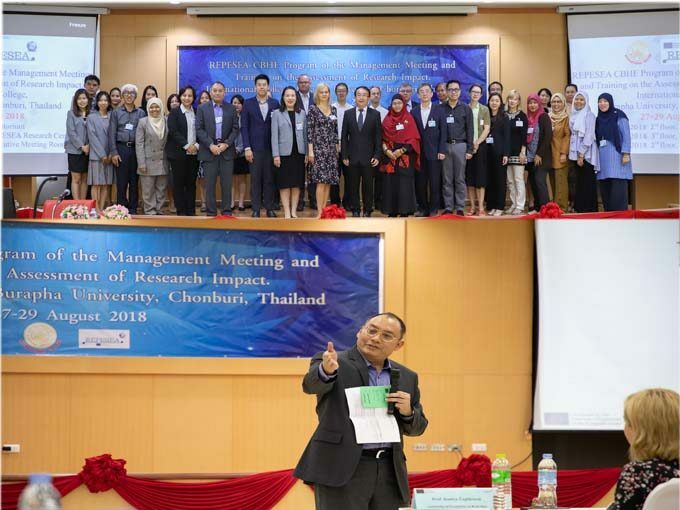 MD FEB UGM Participated in REPESEA Program of Management Meeting and Training on the Assessment of Research Impact at Burapha University and NIDA International College Thailand. The REPESEA is a cooperation project among universities in Asia and Europe funded by the European Union through the Erasmus Capacity Building in Higher Education (CHBE) scheme. It is three years cooperation which has been started since October 2016. Continuing the four previous meetings at 2017 those are Kick-Off Meeting in Bratislava followed by three workshops held in Malaysia, Indonesia, and Bratislava, the training at Burapha University and NIDA International College is held on 27 – 31 August 2018. This activity focuses to train staffs in partner universities of the assessment in research impact. Thus, the assessment system will be developed in the form of training modules that will be used by consortium members to improve the quality of research in each university. In addition, the modules are also expected to serve as guidelines for other universities in each member’s home country as an effort to increase the capacity to produce high-quality research. Delegates from MD FEB UGM are Dr. BM. Purwanto, Dr. Tur Nastiti, and Dr. Choirunnisa Arifa. Dr. BM. Purwanto is appointed as one of the trainers in a session entitled Defining Criteria for Assessing Research Impact on Developing Countries. Besides, the training also invited another valuable trainers in the topic of assessing research impact from University of Bath, Matej Bel University, and Burapha University. Furthermore, Dr. Tur Nastiti and Dr. Choirunnisa Arifa are two participants among those coming from Universitas Islam Indonesia (UII- Indonesia); Universiti Teknologi Malaysia and Universiti Teknologi Mara (Malaysia); The National Institute of Development Administration and Burapha University (Thailand); Matej Bel University and University of Economics in Bratislava (Slovakia); Warszaw School of Economics (Poland); and University of Bath (UK).